Capital of the province of Manitoba, Canada; situated at the junction of the Assiniboin and Red rivers. 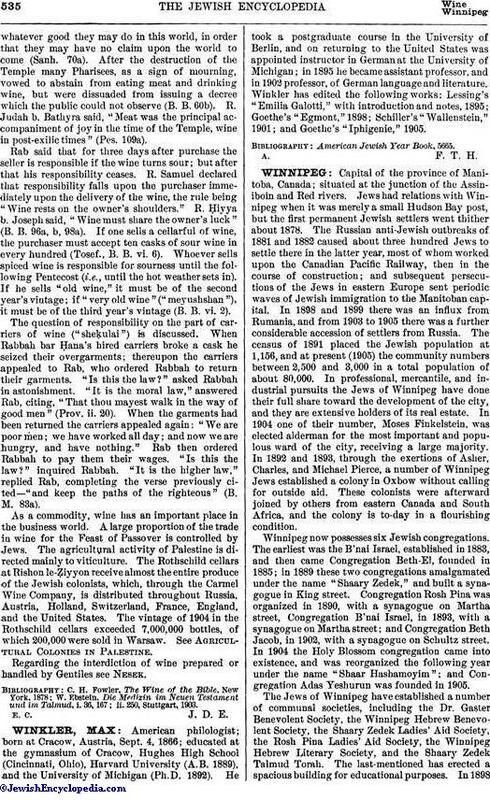 Jews had relations with Winnipeg when it was merely a small Hudson Bay post, but the first permanent Jewish settlers went thither about 1878. The Russian anti-Jewish outbreaks of 1881 and 1882 caused about three hundred Jews to settle there in the latter year, most of whom worked upon the Canadian Pacific Railway, then in the course of construction; and subsequent persecutions of the Jews in eastern Europe sent periodic waves of Jewish immigration to the Manitoban capital. In 1898 and 1899 there was an influx from Rumania, and from 1903 to 1905 there was a further considerable accession of settlers from Russia. The census of 1891 placed the Jewish population at 1,156, and at present (1905) the community numbers between 2,500 and 3,000 in a total population of about 80,000. 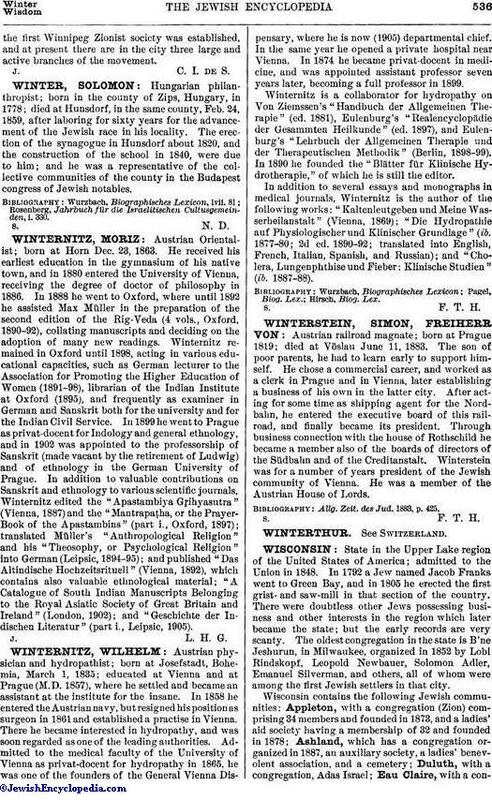 In professional, mercantile, and industrial pursuits the Jews of Winnipeg have done their full share toward the development of the city, and they are extensive holders of its real estate. In 1904 one of their number, Moses Finkelstein, was elected alderman for the most important and populous ward of the city, receiving a large majority. In 1892 and 1893, through the exertions of Asher, Charles, and Michael Pierce, a number of Winnipeg Jews established a colony in Oxbow without calling for outside aid. These colonists were afterward joined by others from eastern Canada and South Africa, and the colony is to-day in a flourishing condition. Winnipeg now possesses six Jewish congregations. The earliest was the B'nai Israel, established in 1883, and then came Congregation Beth-El, founded in 1885; in 1889 these two congregations amalgamated under the name "Shaary Zedek," and built a synagogue in King street. Congregation Rosh Pina was organized in 1890, with a synagogue on Martha street, Congregation B'nai Israel, in 1893, with a synagogue on Martha street; and Congregation Beth Jacob, in 1902, with a synagogue on Schultz street. In 1904 the Holy Blossom congregation came into existence, and was reorganized the following year under the name "Shaar Hashamoyim"; and Congregation Adas Yeshurun was founded in 1905. The Jews of Winnipeg have established a number of communal societies, including the Dr. Gaster Benevolent Society, the Winnipeg Hebrew Benevolent Society, the Shaary Zedek Ladies' Aid Society, the Rosh Pina Ladies' Aid Society, the Winnipeg Hebrew Literary Society, and the Shaary Zedek Talmud Torah. The last-mentioned has erected a spacious building for educational purposes. In 1898the first Winnipeg Zionist society was established, and at present there are in the city three large and active branches of the movement.